Synopsis, Our Opinion: This Estate Cabernet Franc is a North Carolina wine we STRONGLY recommend. Producer/Winery: Hutton Vineyards; Dobson, North Carolina. Geographic Appellation, Region, Country: Yadkin Valley, North Carolina. Purchased From: Hutton Vineyards tasting room. Paired With: Venison stir fry. 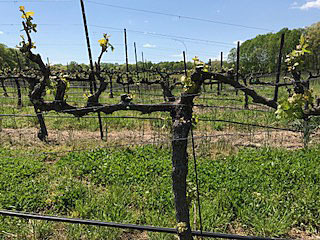 Preamble: Last Spring we had the opportunity to visit the Hutton Vineyards (see Wine Tasting at the Hutton Vineyards) and taste their wines. Hutton is a unique North Carolina vineyard and all of their wines are good, but we selected the Estate Cabernet Franc as the one we liked best. 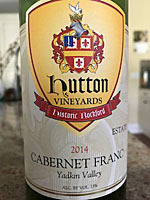 Following is our review of the Cabernet Franc we purchased during our Hutton Vineyards tasting. Opened 45-minutes before drinking. Clear, garnet color with the same color rim. Classic Cab Franc bell pepper aroma along with earthy cherry, dried hay and occaisional whiffs of clove. Smooth entry, persistent fruit, on the light side of a medium body and a 150-grit texture. Green pepper, cherry and pomegranate flavors with strong hints of cinnamon. Bright acidity, green tea like leathery tannins and a medium-long, cherry and tobacco finish. Just a tad fruity sweet but very rich in the bouquet, taste and extended aftertaste. It was an EXCELLENT pairing with the venison stir fry, but didn’t hold up as well as a sipping wine. In the end we both said it was probably the best North Carolina Cab Franc we’ve had. Our palates are super sensitive to any sweetness in wine and there was a fruity sweetness in this Cab Franc. Now with all that said, before we finished the last pour we were already talking about another visit to the Hutton Vineyard which probably says it all!!! This Estate Cabernet Franc is a North Carolina wine we STRONGLY recommend. Comments: Learn more about the Hutton Vineyards and their wines.